Lincoln’s Honeyboy Turner Band has an Omaha CD release party at Havana Garage Friday, April 19, 9 p.m. for their new disc Billiard Playin’ Mama. This is a free, 21 and over show. The band is fresh from a CD release event at Lincoln’s Zoo Bar last week that featured guest appearances by Chicago players in town for the Jammin’ Away the Blues concert last Saturday at Lincoln’s Bourbon Theatre. 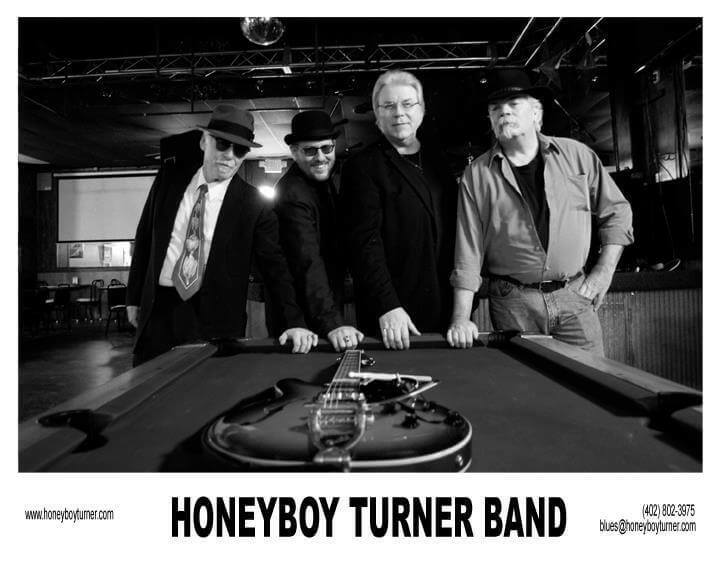 Saturday night Honeyboy Turner Band played tunes from their new disc and backed up fine Chicago guitarist Rockin’ Johnny Burgin and iconic vocalists Mary Lane and Tail Dragger. It was a celebration of classic Chicago blues. The Blues Society of Omaha’s final preliminary round of this year’s Nebraska Blues Challenge is Sunday, April 21, 3 p.m. at McKenna’s. Performing are Marcos & Sabor (3 p.m.), Blind Willie McChitlin (MoJoPo) (4:10 p.m.), Back Alley Blues Band (5:20 p.m.), and Drew Jude & the Cool Tones (6:30 p.m.). The event is all-ages and cover is $5. Levi William (2012 Nebraska Blues Challenge winner) withdrew from the competition because bass player Brian Farr is still recovering from shoulder surgery. Blues guitar great Jimmy Thackery plugs in at Lincoln’s Zoo Bar Wednesday, April 17, 6-9 p.m. and plays The 21st Saloon Thursday, April 18, 5:30-8:30 p.m. Blues and soul man John Nemeth hits the Zoo Wednesday, April 24, 6-9 p.m. Nemeth is part of the 21st Saloon’s first outdoor parking lot party Thursday, April 25, 5:30 p.m. with Brandon Miller Band (K.C. ), Dustin Pittsley Band and headliner John Nemeth band. Progressive funk band Euforquestra brings their amazing musicianship to Slowdown Thursday, April 18, with Blue Martian Tribe. Webb Wilder plays the Zoo Bar Sunday, April 21, 6 p.m.
Watch zoobar.com for announcements on the Zoo Bar 40th Anniversary line-up soon. There will be multiple bands in the club July 1-3 and music on an outdoor stage on 14th St. July 4-6.